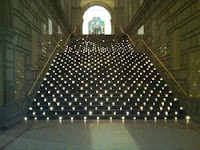 If you live in New York or have visited any large city in the U.S., and more and more abroad, you know that you can spend your life and your fortune going to benefit dinners for many of the noblest of causes and institutions from medical, to educational to art. They tend to be pretty interchangeable. I recently attended such a dinner that was distinctly different. 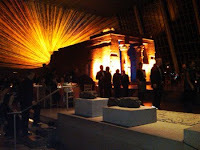 The Metropolitan Museum of Art held its annual Acquisition Fund Dinner in the impressive surroundings of the Temple of Dendur. It is just what it sounds like. Its “raison d’ être” is to raise general acquisition funds for the institution which remains steadfast in its commitment to building its collections. Even in this difficult year the dinner yielded $1.3 million. When Tom Campbell, the new director of the Metropolitan, was introduced he explained that when he took over at the helm on January 1, 2009 in the middle of the worst financial crises this country has known in 75 years, he was concerned as to how he would meet the expectations of the company assembled for this annual event. 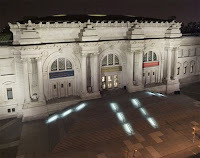 Major acquisitions had been regularly announced by the former director of the Met, Philippe de Montebello, who was responsible for the acquisition of some 84,000 plus works of art over his tenure of 31 years at the museum. But Tom Campbell realized that things would not be so bad, when, at his maiden acquisition committee meeting, Ian Wardropper, Chairman of the European Sculpture and Decorative Arts Department, presented a major work of art. He proposed one of the prized oil lamps by the Italian Renaissance sculptor Andrea Riccio, and the funds were made available for its purchase. The evening focused on two other acquisitions: a painting by the sixteenth century painter Jacopo Basano, and a collection of American art pottery. They were presented in short films produced by the Metropolitan showing the director and his curators discussing the acquisition process. The Bassano, his last work, had been turned down when it was offered to the Met 40 years earlier. When the painting again became available, however, Keith Christiansen, the newly-appointed head of the European Paintings Department and a specialist in Italian Renaissance painting. became convinced that it was vital to the Museum’s collection because it completed the story of Renaissance Venetian art. Together, Campbell and Christiansen approached the collector Mark Fish, and when he viewed the work at the Toledo museum where it was on loan he agreed to buy the painting and make it a promised gift to the Museum. In his closing remarks, the director announced that Mark Fish had told him earlier that day that when the gift was finalized it would be given in honor of Philippe de Montebello. The collection of American Art Pottery was assembled by Bob Ellison over a 45 year period. It includes examples of all the important American potters from the last quarter of the 19th century through the first half of the 20th. The curator for American Decorative Arts, Nonnie Frelinghuysen, explained that when the American wing was being renovated she designed cases on the mezzanine gallery which would be perfect for housing the Ellison collection. She inserted images of pots from his collection in the designs. Bob Ellison said, that at that point Nonnie began to invite him regularly to follow the progress of the wing! In the end, what started out as a loan of 50 to 60 pots for the wing’s opening became a promised gift of the entire 250 piece collection. This was a wonderful illustration of the dynamic between curator and patron. For the second time in the evening Tom Campbell thanked those assembled for being, in no small part, contributors to the acquisition funds that made it possible for new treasures to come to the Met. Those participating not only received insight into what goes on behind the scenes, but they also felt part of the process, … a truly educational and uplifting evening.